Home / Blog / “Their Head” or “Their Heads”? I received an excellent question on our Facebook page recently. Instead of answering right away, I threw it out for discussion and received an unexpected number of replies — with much disagreement among them. So, I thought I’d take a moment on the blog here to give my perspective. Which of the following is correct: “They balance a basket on their heads” or “They balance a basket on their head”? And can you please explain the correct answer? I found it curious how confident my Facebook friends were in answering the question, yet they were unable to point to the grammatical principle upon which they based their answers. And the answers differed widely. What’s frustrating about this question is that I don’t know what to call this problem¹. It’s not pronoun agreement because possessive pronouns agree with their antecedents, not with the words they modify. And because I don’t know what to call it, I don’t know how to research it. So the following is simply my unsubstantiated perspective. They balance a basket on their heads. They balance a basket on their head. They balance baskets on their heads. They balance baskets on their head. Let me repeat. All of these options are grammatically fine. No errors in agreement or possession exist in any of the four. The question, therefore, isn’t which is correct, but which most clearly expresses the intended meaning. And we don’t have enough information to know for sure what the intended meaning is, so we’ll have to guess. We know the subject of the sentence is plural (they), so we are speaking about more than one basket-balancer. We don’t know if there is one basket or more than one. Both of the sentences in the original question refer to “a basket,” but I suspect she meant that each of the people were carrying a single basket, and therefore, there are a number of baskets in total. Let’s assume that. It’s possible that each person is balancing more than one basket on his or her head, but let’s assume there’s only one. 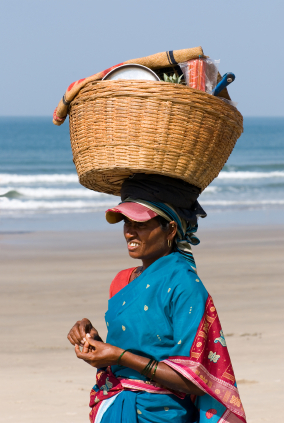 So, we want to communicate that there is a group of people each balancing a single basket on his or her head. Let’s look at the four options previously mentioned. This works, but the image that first came to my mind was of a group of people balancing a single large basket on their collective heads. The sentence is therefore ambiguous — it can be misinterpreted. This one can also be understood as intended, but there’s something funny to me about saying “their head” — as though they all share a single head. Common sense is enough to eliminate this possibility, of course. This one can also be correctly understood, but by making baskets plural, it can also be read as though each person has several baskets on his or her head. Also potentially correct, but this might also describe multiple baskets on a single, shared head. Which is weird, of course. So, what am I saying? None of these are okay? All of them? Yes. That’s exactly what I’m saying. This is an odd semantic situation where it is impossible to entirely avoid ambiguity. English just isn’t perfectly clear in situations like this. All you can do is choose the phrasing that is least likely to be misunderstood. There is no right or wrong. They each balance a basket on their heads. The singular head would be okay too, since each has a single head, but there are collectively several heads, so I prefer the plural “heads.” Either way. This is a real stumper, huh? What do you think? How would you express this idea in a single sentence? Oh, and if anyone knows of a name for this semantic situation, I’d love to learn it. Please leave your suggestions or comments below! of use. I appreciate that indeed. I think this is called: subject-complement agreement. And it’s definitely convoluted. Thanks for your take on it. Another distinction: I was just editing an essay which used the term: affecting their livelihoods. A quick internet search seemed to make a distinction between “affecting their livelihood” when they all work at the same type of job and “affecting their livelihoods” when talking about different types of jobs. Yes! Thank you. That’s exactly what this issue is. I appreciate your defining the issue, since it is difficult to do any research without knowing what to call it! As an ESL person, I was struggling with this issue, and LOVE your explanation. I have to say, I like your analysis here, but there’s one thing missing–I spent this entire post waiting for you to bring up the singular “they.” The way I read the sentence, it was referring to one person of indeterminate gender, with one basket on his/her head (or, less awkwardly put, “their head”). It’s not so much the lack of clarity in the number of baskets, or the number of heads; it’s the intentional lack of clarity with reference to the person’s gender. Of course, if we put in the implied cultural context–Africa, although I’ll freely admit this is just me basing my inference on the media and stereotypes, since I do rather lack knowledge in that area–it’s fairly safe to assume the person being referred to is a woman, since (at least as far as my incomplete knowledge goes) it’s women who carry things that way. So, it could be, as you think, multiple people carrying one basket each on each of their heads, or it could be one person, carrying one basket, on their one head. I don’t know what your opinion on the singular “they” is, though. I know many people think it’s incorrect, but just as many seem to believe it’s correct. Could be an interesting post? Unless you’ve done one on it already, that I haven’t read (relatively new reader here, so this could easily be the case). Also, one thing I forgot to add: the entire clarity problem would be fixed if the sentence were in it’s proper context. We’d know if it was one person, or multiple people, and how many baskets there were on each person’s head. Good thoughts, Jos. And welcome to the blog. Your question illustrates why I don’t like fixing the gender-neutrality problem by using “they” or “their” in a singular sense–it adds more ambiguity to the language. There’s something amiss when a sentence that begins “They balance baskets…” causes the reader to wonder if we are talking about one person or more than one. They is the plural pronoun after all. It should be crystal clear that the sentence is referring to multiple people. But after years of popular use of a “singular they” it’s no wonder you found it unclear. Just wondering: any chance the image of the single woman balancing a basket bias you into thinking the sentence was about one, rather than several, women? I wasn’t able to find a good photo with more than one basket-balancer. It is about clarity. As an editor, I often have to make decisions about wording that just clarifies and makes more sense rather than being absolutely correct grammar. If I have to reread a sentence to understand completely, then I know it needs to be clarified. Good post. Always insert a word, lol! A post for word nerds. I love it! Thanks for making my brain hurt this morning. I believe the word you are searching for is ‘equivocation’. The problem is that, semantically, the words begin to ‘equivocate’ as we read them. We all have a core idea of what is going on here… ten African women on the way to market, each with one basket on their head. But the words have possibilities for other meanings, and so they ‘equivocate’ in our minds. A whole lot of word humor is based on this idea of equivocation. Say, did you hear the one about the double positive? I see. But equivocation (like ambiguity) is a rather broad term. I was hoping there might be some particular name for this problem with singulars/plurals. I was unable to find any help online because I didn’t know what to search for.